This is one book that will make you laugh, cry and yell out at the same time. There are many stories of fate in this book. Is it fate, coincidence or just divine intervention? Whatever your views are, there is always an higher power when you have something happen. All things happen for a reason, even if we may not realize it at the moment or even if it's years later. Every event in life happens for some reason or another. Brenda and Arlene co-wrote this together starting in 1999. Arlene was a teacher and Brenda was a lawyer when they'd met online in a writers group. Both have contributed several stories to the book and both are certainly worthy of the fate that has brought them together. You could say that fate brought the two writers together. While everyone that experiences a moment of fate, some never will realize that "Fate" is why things happen. 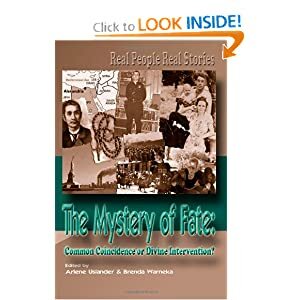 I want to thank Arlene for giving me a copy of the book, "The Mystery of Fate" to read for my own honest thoughts of the book. By reading the book, it brought several moments of my own fate back into my memory. I highly recommend reading this book and I do recommend discussing it in book groups as well. This will bring on a really wonderful topic for all to discuss for a long time to come!